Aaron Judge took the American League and baseball by storm in 2017, knocking home run after home run, all season long. When the year ended he had totaled 52 Home Runs - establishing a new Major League Baseball record for the most home runs hit by a rookie. 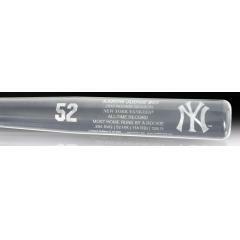 To celebrate this great achievement, we are pleased to announce the release of this beautiful, full-sized acrylic Commemorative Bat honoring Judge and etched with his 2017 rookie season statistics. In 2017, Judge hit 52 home runs, had 114 RBI, scored 128 runs and hit for a .284 average, on his way to winning the AL Rookie of the Year Award. These beautiful, laser-etched bats will look great displayed on any wall in your home or office. Order yours today before they are gone. Due to the limited nature of this release, we must charge your credit card for the full price immediately upon taking your order. This policy ensures we reserve a bat for you. We will confirm your order by Email. This bat is not game used. Please allow 4 to 6 weeks for delivery. Please be aware that these bats may shatter like glass if dropped.